Three days have passed since I received my deluxe edition copy of Kingdom Hearts III for the PlayStation 4 and from what I’ve played so far, I’ve enjoyed. Since the game was announced in 2013, it’s been a long time coming for the fans of the Disney/Square Enix adventure RPG series. So, does Kingdom Hearts III live up to its hype? The Deluxe Edition comprises of the game disc itself in the standard retail packaging, with a black steelbox case imprinted with the symbols of Mickey Mouse, hearts, and keys. The inside of the box is clear plastic, like the standard package. There’s also a small hard-cover book with different artwork of characters, items, weapons and worlds. It’s not glamorous, but cool to flip through. Finally, there’s small enamel pin of Sora wearing a crown secured to the outer packaging. Overall, not bad for $111.99 CAD (the game itself retails at $79.99 CAD). For those who’ve never played a Kingdom Hearts game, the story can be daunting (even for someone who’s played all or most of), considering this is the third “main” title in the series, intertwined with half-dozen spin-off titles as well as remixes and remasters of the first two main titles. Without any spoilers, the first hour or so of the game helps recap the events previous to bring the player up to speed on what’s happened, who’s who and so forth. As anyone who’s kept tabs on the development of Kingdom Hearts III knows that it this is a work of art. Over the years, clips from the game were shown at E3, D23 and whenever Square Enix felt like teasing fans, it generated a lot of buzz over how the Disney worlds are recreated in stunning detail, as well down to the outfits and weapons. With the power of the PlayStation 4 and Xbox One consoles, Square Enix was able to take advantage of the hardware and the Unreal Engine to make Kingdom Hearts III so visually appealing. In an interesting twist, they kept the designs the same when dealing with cut scenes from previous games in the series instead of recreating them in this new space. I will say this, Kingdom Hearts III is cut-scene heavy, so keep that in mind as you will go 10+ minutes at a time without any battles or exploration. Mad Tea Cups Attraction Flow in use. The game-play is improved and Square Enix has crammed as much new functionality into the game as they can. Attraction Flow brings various rides and attractions from Disney Parks around the world to use to as well-timed and coordinated battle tactics — using Splash Ride, for instance, lets you move around and jump to create a trail, once Finish is selected, the ride follows the trail created to take out enemies in its path. It’s a neat way to take out large groups of Heartless in one fun swoop. With Mad Tea Cups, Sora, Donald and Goofy, jump into oversized cups and saucers which spin around and damage nearby Heartless or Nobodies. It’s not as nauseating as the actual ride, though. Shotlock is new allowing Sora to target multiple enemies or one enemy multiple times — it’s tricky to use as each use depletes the gauge; once expired it needs time to refill. In conjunction with Shotlock is Airstepping which allows Sora to jump to objects or bosses in the distance (also helpful in escaping said bosses). Airstepping still works if the gauge is empty, which is handy in tight situations. Sora in his new outfit in Kingdom Hearts III. Music is a huge part of the Kingdom Hearts franchise, and yes, there are familiar themes and leitmotifs — especially “Destati”, “Hand in Hand”, and more. But on top of these classics, there’s also new music, even songs from previous worlds were remixed to give them more oomph for this game. Of course, the biggest hit is the Utada Hikaru and Skrillex composition, Face My Fears, as the opening song for the game. It fits so well into the game overall, given how everyone has to overcome their fears to find those that matter to them. The voice acting is decent, considering the return of Haley Joel Osment as Sora, Tony Anselmo as Donald Duck and Bill Farmer as Goofy, though in some scenes the voices sound slightly awkward. And in Olympus and contrary to his character, Phil does not speak at all (not sure if Danny DeVito was available for the role). My adventure so far with Sora, Donald and Goofy is off to a great start and I look forward to the enjoying more of the magic Kingdom Hearts III has to offer. With only a month and a half left before the launch of Kingdom Hearts III, Sqaure-Enix has unveiled the opening cinematic featuring the song Face My Fears by Utada Hikaru and Skrillex. At the Sony E3 Conference Monday evening, another teaser for Kingdom Hearts III was unveiled, this time focusing on the Pirates of the Caribbean world. Captain Jack Sparrow is back, teaming up with Sora, Donald and Goofy, who, like in other worlds (e.g. Toy Story, Monsters, Inc.) now don era appropriate buccaneer attire. Sora also wields a new keyblade, now much different from the Follow the Wind in Kingdom Hearts II. Scenes in the video are replicated from Pirates of the Caribbean: At World’s End, the third film in the franchise, where Captain Barbossa, Will Turner, Elizabeth Swan journey to Davey Jones’ Locker to save a “dead” Captain Sparrow. Also revealed is a new battle function where Sora captain’s a full-on pirate ship and goes head-to-head in an all out sea battle, cannon’s blazing. Sora now can hitch rides on flying Heartless and skim colourful rainbow clouds over the deep blue sea. Following the nautical clips were recaps of the Frozen, Tangled and Monsters, Inc. worlds and a reveal of some familiar Organization XIII members — Xigbar, Larxene, Axel and Xehanort. Kairi and Riku round out the end of the video, in their updated wardrobes. With a little over day to go before E3 actually kicks off, Square Enix has been busy releasing more details about Kingdom Hearts III; there was the official launch date last night (it’s January 29th, 2019) and now a new teaser featuring Disney’s Frozen. Sora, Donald and Goofy journey to Arendelle shortly after Queen Elsa condemns the Scandinavian nation to eternal winter. After seeing the queen dash across the fjord, they meet Anna, Krisftoff, Sven and Olaf trudging through the newly fallen snow to find Elsa. Sora can now snowboard thanks to Goofy’s shield, which is large enough to hold himself, Goofy and Donald for quick trips down the mountainside. Elsa’s abominable snow beast, Marshmallow, also makes his début, adding to the throngs of Heartless created by the darkness. In addition to the frozen world of Arendelle, the video includes scenes from the worlds of Tangled, Monsters, Inc., and Hercules. Of course, at the end, Aqua briefly appears, her now yellow eyes, glaring at us as the Kingdom Hearts III logo fades in. After years of waiting, Square Enix has unveiled the release date for Kingdom Hearts III as January 29th, 2019. This date was at the closure of the Kingdom Hearts orchestra early Saturday evening advance of E3 which opens next week. Square Enix had previously mentioned that they would announce the launch date during E3 and that it would hit store shelves sometime in 2018. Kingdom Hearts III will be available on both the PlayStation 4 and Xbox One. Square Enix hosted a Kingdom Hearts III premiere in Santa Monica, California giving fans and the media a chance to try out the upcoming title. 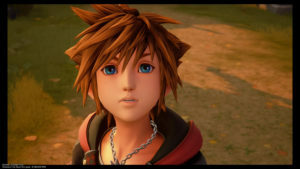 Staff who worked on the game were in attendance to speak to the crowd, while guests could sample cerulean-hued sea salt ice cream and snap selfies holding full-sized keyblades. Two playable levels, Mount Olympus (from Hercules) and Toy Box (from the Toy Story franchise), were enough to satisfy cravings for this hotly anticipated title, but to also show off some of the unique mechanics that were developed to include more action and excitement. Development staff, including Executive Producer Shinji Hashimoto, were on hand to discuss some of these features. Reception from those who played the game were positive, many enjoying the familiar menu commands, and added functionality of switching between two keyblades using the D-pad, keyblade transformation, Shotlocks, Attractions, and Links. Sora’s keyblade can transform and increase its attack depending on the world. In Toy Box, the Hyper Hammer can strike enemies quickly with a powerful punch; whereas Twin Yo-Yos can reach out and deal some serious damage. Shotlocks allows Sora to lock on and track multiple enemies at once. Using a specific combo, he can then hit each target sequentially. Attractions are similar to the rides found at Disney Parks around the world: Big Magic Mountain is a rideable train that chugs up and down like a roller coaster, akin to Big Thunder Mountain Railroad at Walt Disney World, except it launches explosive fireworks (something that doesn’t happen on the real ride). Finally, Links (formerly Summons) allows Sora to call forth other Disney heroes to help out in battle. Ralph, from Wreck-it Ralph, jumps into the fray and can build walls with cannons to take out any enemies in their line of fire. Kingdom Hearts III is almost here, with an expected launch in 2018. Square Enix plans to reveal a specific date at this year’s E3 next month. With D23 Expo taking place in Japan, the talk has focused around Kingdom Hearts III and if a new trailer for the title would drop. Square Enix and Disney surprised everyone with not one, but two teasers for Kingdom Hearts III. The first video unveils a new world from Monsters, Inc., where Sora, Donald and Goofy, team up with Sully and Mike to scare children as they settle in for bed. Our protagonists even transform into these creatures, keeping inline with the rest of this denizens from this Disney comedy. There’s also additional scenes from the Toy Story and Tangled worlds, where Sora gets to showoff some of his new moves. Interestingly enough, some familiar faces from Organization XIII make a return. Utada Hikaru is back for a new song, titled Oath. She also performed the theme songs for the previous games in the series with Simple and Clean in Kingdom Hearts and Sanctuary in Kingdom Hearts II. Visuals include scenes with Riku, King Mickey, Xemnas and old villains Maleficent and Pete. Kingdom Hearts III is expected sometime in 2018 for both the PlayStation 4 and Xbox One. At Disney’s D23 event this afternoon, Square Enix director Tetsuya Nomura announced that Kingdom Hearts III would be launching in 2018 and presented a trailer detailing a new world in the game based on Disney Pixar’s Toy Story franchise. Protagonists Sora, Donald and Goofy, transform into action figures as they enter Andy’s bedroom. Upon learning from the other toys that Andy’s disappeared, they must join forces with Woody, Buzz Lightyear, Rex, Hamm and Sarge as they fight off the Heartless in the long journey to the Galaxy Toys store. Sora gains new abilities in the Toy Story world. Woody and Buzz can lend Sora their strength to create a giant mallet and strike multiple Heartless at once. Once in the store, he can also take control of large toy robots and use them to battle other larger toys, utilizing their large cannon arms. Kingdom Hearts III will be available on the PlayStation 4 and Xbox One sometime in 2018.